Beach Fitness Barcelona is all about having fun whilst getting fit outdoors – away from the stuffiness and routine of the gym. Every session is different which keeps it interesting and we mix up the circuits, strength work and running with team games and exercises. It is my absolute perfect way to start the day, and at this time of year we also get to see the most stunning sun-rises over the Mediterranean. I would then make sure my run home took me via a baker so that I could have breakfast on our terrace with my family. Croissants and fresh Orange Juice in the dappled morning light just as the warmth is starting to creep into the day. 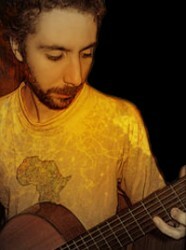 Then I’d go up to c/ Montseny in Gràcia for a flamenco guitar class with Milos Sajin at Shine School of Guitar. Milos has an incredible way with his students that encourages and inspires you in equal measure and for someone like me who at best would be described as ‘not a natural musician’ he is also very patient. After the guitar class I would head up to the Sant Gervasi area where I would join a Brazilian Jiu Jitsu class taught by Robin Gracie, the youngest son of the Grandmaster and founder of Brazilian Jiu Jitsu, Helio Gracie. Robin has a very relaxed way about his classes that is very different from the general perception of Mixed Martial Arts which makes it enjoyable for everyone. After that hectic morning I would head back down into town on my motorbike, taking my time so I can enjoy the sights on the way. There is a point heading down c/ Muntaner where you crest the hill and the sea is laid out in front of you glittering in the sunshine. I love that moment and never get tired of it. Then into the Eixample and into Gaudí territory before hitting the hustle and bustle of Plaça de Catalunya before heading down La Rambla catching glimpses of the street performers as I ride past before arriving at my destination, the Boqueria market. Here is where I would have lunch at the small seafood stall/restaurant in the market where they cook the days catch in front of you – there is nothing quite like it. After lunch I would head home for a well earned siesta with my beautiful wife. 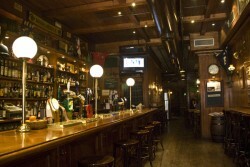 Post-siesta, it has to be all about watching some sport with friends at one of the many Irish pubs in Barcelona. Watching England beat either the Welsh or the Aussies at rugby would be my first choice and I would probably head for the Philharmonic (c/ Mallorca, 204) where the dreadfully slow service is more than made up for by the familiar faces and the steak pie! Then it would be home for a bit of quality time with the kids before my wife and I would start to think about our evening out, getting ready with the obligatory Cuba Libre to set the mood, before heading initially to a bar whose name escapes me on c/ Verdi for some great cheese and wine before wandering back down the hill for dinner at Bar Mut on c/ Pau Claris. Bar Mut is sort of ‘fine-dining tapas’, the concept is all about refining traditional tapas dishes and it definitely works. Andy owns an IT recruitment company with offices in Amsterdam and Barcelona and also runs the Beach Fit Barcelona sessions on Barceloneta Beach. He has been living in Barcelona for 4 years.